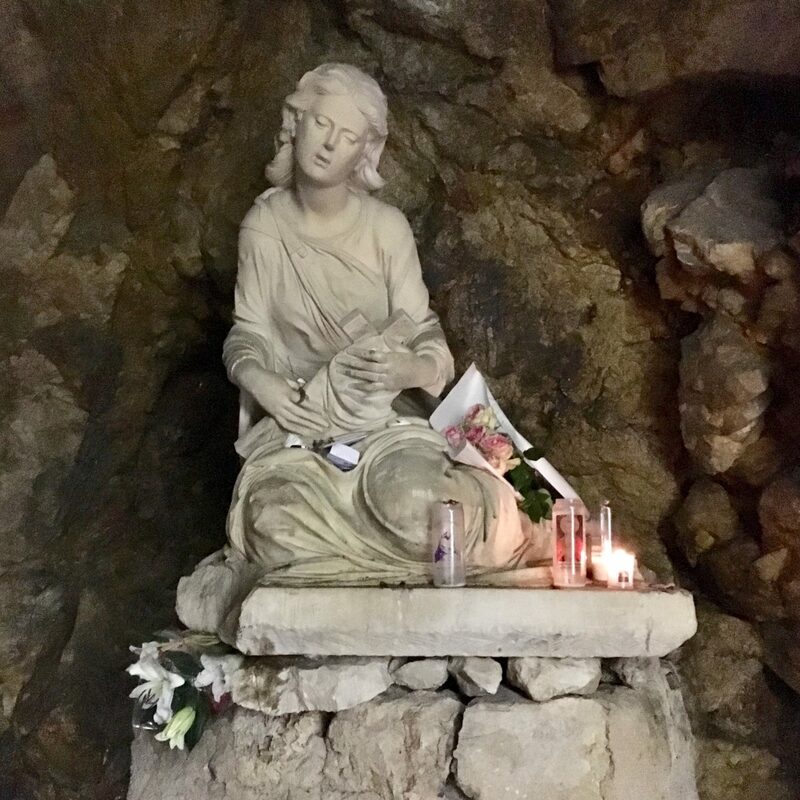 These sounds came through while I visited the cave of Mary Magdalene in Sainte-Maximin-la-Saint-Baume (southern France) on August 1, 2018. It was early morning, the golden rays of sunlight shone through the trees while I hiked to the cave in the mountain. Emotions moved through me. No stories, just sensations flowed inside my body. I knew something was about to happen in the cave... When I reached it, it was so quiet, no visitors around. After a while I sat down at one of the statues and the sounds started coming. There she was: Mary Magdalene. The Divine Feminine spoke through me; raw, deep and delicate, all at the same time. It was an intimate encounter, a reunion in spirit. So much love, sooooo much love. And then after 5.40 minutes a monk came and asked me to stop sining. “We are only allowed to pray the prayers that we are used to praying here,” he said. I retired in silence and felt immensely grateful for my Musical minutes with Mary Magdalene. Best listening to these sounds while lying down. You can listen to it as often as you want. This transmission can contribute to profound inner cleansing, a clear mind, softness and stillness, peace and an open heart. It opens up your memory of precious ancient inner wisdom. Besides it helps you connect with your multidimensional self. These high vibratory sounds, also called light languages and light codes, originate from other dimensions. They dance through you as energetic laser-light beams. As if you were under a shower of light. With the reception of these higher frequencies, automatically hidden aspects (lower frequencies) in your being are exposed and loosened up. Those lower vibrational energies then no longer fit into an increased vibrational environment. Think of it as an energetic upgrade of your whole being and at the same time a great cleansing of that which is ready to surrender to the light. You can see this transmission as a cosmic vacuum cleaner process that, on the one hand, blows high frequencies into your being and on the other hand picks up all the dust that comes loose. Exactly that which is ready for transformation is included in this process. It may be that your mind experiences 'short circuit' and does not understand what is going on. This happens because the energetic information is transferred to you without your mind being involved and can feel thrown out of work or sometimes even bored. This is all part of the process :-). It challenges you to surrender as much as possible to what your mind does not know and to trust that the energy upgrade is received with open arms by your higher consciousness. Mijn naam is Sandra de Vos. Door middel van de verhalen, gedachten & gedichten bied ik je een kijkje in mijn belevingswereld. Sommige mensen noemen me een sjamaan, anderen zien me als een spreekbuis, channel, healer, soul activator, medium, metaphorical storyteller, cosmic danser, tolk-vertaler, zielsbegeleider, katalysator of zelfs transformatorhuisje, afvoerputje, stofzuigerslang of buitenboord versterker. Als je daar een mix van maakt, dan kom je een heel eind. Lees hier meer over mij.